Did your neighbor just called animal control on you again because your dog never stops barking? Well, then instead of going “My dog? Causing a problem? How dare you?” you would want to know about the best device to stop dog barking! You know, dogs will bark – it is how they communicate – it is all natural, but there is a limit. Your dog barking unnecessarily can irritate anyone including you. Thus, you would want to diffuse this potentially hostile situation calmly. In this post, we will help you discover the best dog bark control devices that will help train your dog. Does Your Dog Or Neighbors Dog Need A Device To Stop Barking? Dogs are man’s best friend, but there is nothing more annoying than a dog that barks nonstop. Perhaps you work from home and can’t attend a call without everyone hearing your (or neighbor’s) pup’s enthusiastic bark. It could be that you have put down your baby for a nap, only to have him/her abruptly awaken thanks to the dog’s annoying bark. Or you work a night shift and are struggling to sleep during the day because the neighbor’s dog has got no chill! If it is your dog, things can be handled easily. However, when it is your neighbor’s dog who’s acting weird, you may find it difficult to address the problem. Anti-bark devices work best under these circumstances. They are available as collars or as freestanding devices. They are not harmful to the dogs and work effectively in stopping the unnecessary barking. What Is An Anti-Barking Device? The anti-barking devices teach dogs and pups that when they bark or make any unnecessary noise, something terrible happens. They are composed of sensors and actuators. The sensors register the auditory signals of the bark and then it activates the actuator mechanism to produce a reaction. In the case of collars, the action can be in the form of electrostatic shocks or vibrations. On the other hand, in the case of freestanding devices, the action can be in the form of ultrasonic frequency sound that only canines can hear. Dogs are adaptable and can be trained easily. So, correcting them using such devices is easy and effective without harming them. What Are The Types Of Devices To Make Dog Stop Barking? There are several different types of anti-barking devices available in the market but the following three types are the most common devices to stop dog from barking. Ultrasonic Bark Control Device : Ultrasonic sounds are only audible to dogs. They are so high pitched that it discourages barking. These are either collars or remote devices that use sensors to detect a dog’s bark. They then respond with an unpleasant ultrasonic sound, powerful enough to stop them barking. These devices always work within the safe limits. Citronella Bark Control Device: Unlike humans, dogs aren’t too fond of citronella odor. There are anti-bark devices that come with the configuration of citronella spray that ejects every time the dog barks. You can dilute citronella with water to make it less unpleasant for your dog. Shock Collar: Similar to sound emitting anti-bark devices, shock collars work on the same principle, but they replace ultrasonic sound with electrostatic shock. Vibration Collar: They are similar to shock collars, but instead, they produce small vibrations when the dog barks that may surprise them. How Does An Anti-Barking Device Work? Anti-barking devices are designed to teach dogs and pups to stop making unnecessary noises and barking. Unpleasant odor, electrostatic shock, vibration, or ultrasonic sound is activated when the device hears barking. The owners can also administer the action when the barking begins. The premise is that the pup will take notice of the action, yet not to be hurt. The devices may be attached to a dog’s collar or located in a yard, house, or kennel. Can An Anti Barking Device Prevent The Dog From Barking? Anti-barking devices prove excellent when it comes to training dogs to behave. These devices are designed carefully keeping in mind that they don’t hurt the canines. A little discomfort is enough for dogs to learn their lesson. When the action is triggered in the form of unpleasant citronella smell, high-pitched sound, or vibration, the dog will discover that it is its unnecessary barking that’s causing the discomfort. So, they will start controlling their excitement of seeing the mailman or any other thing that rattles them. Moreover, they prove to be excellent when you are training your dog. However, we recommend that you only use the device when necessary. Prolonged use may lead the dog to be aggressive, fearful, or shy. What Is The Best Device To Stop Neighbors Dog From Barking? 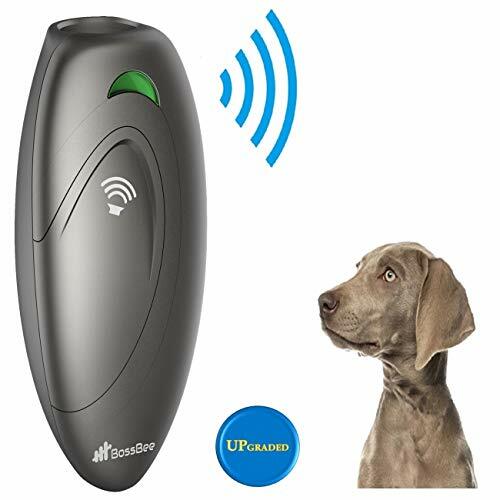 Of all the available anti-bark devices, ultrasonic bark control devices are one of the best to prevent dogs from barking. Ultrasonic sounds are audible to dogs only. They are highly reliable and effective. The best part about ultrasonic bark-control devices is that it can help you prevent your neighbor’s dog from barking. These are the freestanding devices that can be installed in your yard or around your neighbor’s close vicinity. Once it registers a dog’s barking noise, its actuators will automatically produce the ultrasonic sounds to quite a good range, forcing the barking dog to shut up. Ultrasonic sounds are not harmful to dogs, given that they are produced in decent quantity; however, they are irritating to dogs. What Are The Benefits of Best Device To Stop Dog Barking? There are plenty of benefits of using an anti-barking device if yours or your neighbor’s dog doesn’t stop barking once it starts. If you use them responsibly, they are one of the most effective and quickest ways to teach your dog some manners, without hurting them. They help get your dogs to stop their excessive barking through reaction simulation. These devices are designed to help you control your dog’s aggressive behavior – effective in calming down an aggressive or angry dog. You will not face any issues with your neighbors’ complaining, nor you will have to complain to them about their barking dog. These devices allow you to take a pleasant nap whenever you want. If you use these devices responsibly, they can help you strengthen your bond with your dog and build a healthy relationship between the pet and its owner. What To Look For In The Best Device To Stop Dog Barking? As discussed, there are mainly three types of anti-bark devices namely sound emitters, spray devices, and anti-bark collars. You need to choose one depending on your dog’s behavior. Anti-bark collars are specially designed for aggressive dogs, for example. So, you need to keep the dog’s behavior in mind when selecting a device type. Dogs come in all shapes and sizes. For large dogs, you can prefer anti-bark collars or sound emitters. For small dogs, sound emitters and spray devices work efficiently. You can consult a vet regarding which type to use that will not compromise your dog’s safety. The anti-bark devices come with the potential range of 50 feet. So, you can easily operate them sitting in your house. There are also some models that offer the maximum effective range of up to 200 feet. The anti-bark devices are designed to register a dog’s bark so that they can get activated listening to one. Hence, the device should only respond to a dog’s bark and not to any loud noise in your neighborhood. Most anti-bark devices come with a 9 Volt battery that can last as long as six months. If you are using the device frequently, then its battery power must be robust and long-lasting. Most devices come with accessories including batteries, chargers, and more. The cost will vary depending on the model you choose, the type, and its features. Most anti-bark devices are affordable and come in a variety of design and shape. What Is The Best Way To Use A Device To Stop Dog Barking? The best way to use the anti-bark device is during the training. Remember, you don’t have to use the device all the time. It will make your dog aggressive. Use it once daily when you think the dog is going to misbehave; such as for a specific time frame. 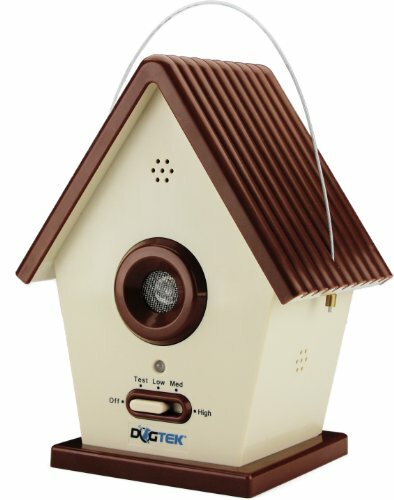 If your neighborhood is filled with nasty, aggressive dogs who won’t shut up no matter what, then Dogtek Sonic Bird House Bark Control device is a great choice. This bark control device boasts the design of a birdhouse that can be mounted on your lamppost, branches of trees, or other fixtures outside your property. The best part, it is completely weatherproof. The Dogtek Bark Control device produces powerful ultrasonic sound waves, thanks to three built-in bark sensors and one XL ultrasonic loudspeaker, sufficient enough to irritate an irritating dog. The multi-level sensitivity feature provides the device with a greater control of nonstop barking outside the home. The Dogtek Bark Control device is a great choice because it has the fully programmable sensitive settings allow you to customize it accordingly. While the device is quite impressive, it has its draw backs. Since it is an ultrasonic device, therefore not all dog breeds may respond the same to the ultrasonic sounds produced by this device. This anti-bark device is one of the few devices that require human intervention. BossBee Handheld Ultrasonic Anti Barking Device with Wrist Strap is mainly used when you are training your dog. And unlike freestanding devices like the one we mentioned above, this device can be used only when required. The device is powered by 4 AAA batteries that can be replaced when used out. Its ergonomic design easily fits into your palm, resembling the automatic car keys. It is a single-button device that comes in two color variants – gold and black. The device also comes with an anti-static wrist strap that comfortably fits around your wrist, making it easy to use when walking or training your dog. While we found this device useful in stopping nuisance barking, we have to admit that the limited range requires you to be in the same room as your dog for the device to be effective. 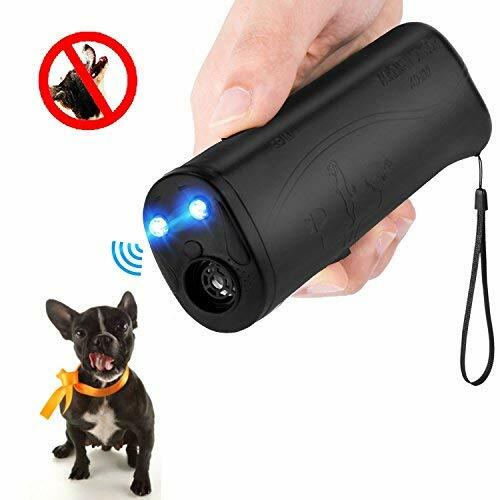 When it comes to an easy-to-use anti-bark device, MEIREN Handheld Dog Repellent & Trainer with LED Flashlight is one of the most productive tools to have. Whether you are scared of dogs or own a notorious one, this device comes handy in preventing undesirable behavior. Its design resembles that of a handheld mini torch and is a useful device that can help you train your dog. The MEIREN dog bark control device fits easily in your pocket, and the wrist strap allows you to secure the device tightly when training your dog. The ultrasonic sound technology offers the maximum range of 50 feet, which is capable enough to send a message to aggressive dogs who want to attack you. This device is an excellent dog training tool that not only stops their nonstop barking but also tames their aggressive behavior like chewing, jumping, or any other unpleasant activity. While this device has it perks, it not very suitable to stop dog barking in the neighborhood. Due to its shape and size, it is mostly useful as a dog repellent while you are either running or cycling. This is one of the best silent dog whistles used by trainers and dog owners to treat the behavioral problems in their dogs. Ortz Dog Whistle to Stop Barking comes adjusted to a variety of frequencies, allowing you to teach commands and discipline to your dog. The varied frequency will enable you to set the pitch according to your dog’s comfort. This anti-bark device from Ortz is excellent for training all breeds of dogs including German Shepherds, Border Collies, Poodles, Hunting Dogs, Huskies, and Rottweilers among others. It is also convenient to carry around thanks to the lanyard strap. 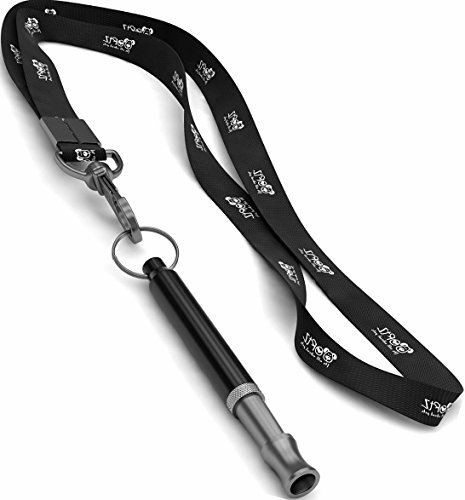 You can simply put the whistle around your neck when dog walking or training. The master call adjustment features of this device allow you to command your dog from wherever you are. You can talk with your pup from far away. While this is a unique device to stop your dog from barking, but you are less likely to use it on a neighbor’s dog. Furthermore, it is not as effective as ultrasonic device and requires an effort from you. This is another freestanding anti-bark device in our list that works very well when it comes to preventing dogs from unnecessary barking. It comes with some excellent features that allow you to keep the barks at bay. The best part about this anti-bark device is that its birdhouse design makes for a unique decor for your yard or lawn. You can easily mount this device on top of a lamp stand or hang it over a tree branch, whatever works for you. The device boasts a built-in timer that has two programmable On/Off presets. It offers a maximum range of 50 feet, which is ideal for neighborhoods with a large number of the dog population. While it does its duties in some respects, I didn’t find it as effective when it comes to deterring big dogs from barking. While my dog responded to it, but other big dogs in the neighborhood did not respond to it very much. 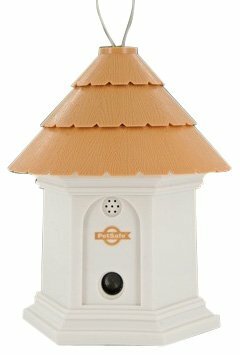 In conclusion, Dogtek Sonic Bird House Bark Control is the best device to stop dog barking from the list. For starters, it works as both a home décor as well as an effective dog bark controller. It offers the maximum effective range of 50 feet, which is enough to control the dogs of the neighborhood. The ultimate selling point is the fact that it is weatherproof. It produces powerful ultrasonic sounds that can easily irritate a big dog while doing no harm to it. Lastly, it is reasonably priced as well. We hope that this guide has helped you in finding the best device to stop your or your neighbor’s dog from barking.